It’s easy to imagine squeezing the power and usefulness of a full-featured mind mapping application onto the 480-by-320 pixel, 3.5 inch screen of your iPhone or iPod touch as an exercise in futility. But Mindjet has managed to squeeze the power, ease, and versatility of its desktop application into a standalone app that fits in your pocket. Tap Your Map: Mindjet makes it possible to create and edit sophisticated maps on your iPhone or iPod Touch. 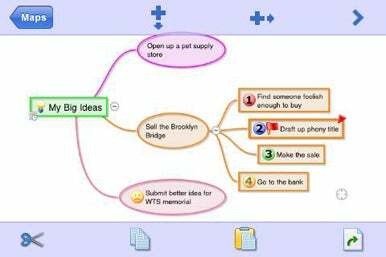 The $8 Mindjet app lets you create mindmaps in either portrait or landscape mode. Initially, it opens to a map management screen from which you can create, edit, and rearrange the maps stored on your phone. Mindjet remembers the last map you were working on with each subsequent opening. When you create a new map, Mindjet takes the title of your map as the central topic. A double-tap on the central topic opens a screen where you can edit the topic; add up to two icons, such as a priority level or check mark; change its shape and color; and add notes, start and due dates, and a percentage of completion. You edit every level of your mindmap in the same way, and I found editing on my iPhone to be simple, intuitive, and painless. The easiest way to create a new subtopic is by tapping twice anywhere on your map. This adds a subtopic to the currently selected topic. To move a topic you can either drag it or tap it once to select it and then tap the location on the screen where you want it to move. When you do, a small cross hair appears. If the cross hair isn’t exactly where you want the topic to move, you can continue to tap anywhere on the screen until the crosshair is perfectly positioned, then tap the crosshair to move the topic to its new position. If you accidentally add a subtopic to the wrong topic, you only need to tap and hold the topic to break its current link and then drag it to the appropriate topic to make the change. Mindjet allows you to share maps stored on your Mac or Windows computer with your iPhone; you can also download maps created or edited on your phone to your computer. Unfortunately, this didn’t work quite as well as it could have. To upload and download maps, you use the Transfer button that appears on the map management screen. When you do, Mindjet creates a unique Web page that you can access using Bonjour or by typing a specific IP address and port in your browser (such as http://10.0.1.5:53957). The Web page that opens displays a list of the maps available for download from your iPhone and provides two buttons for selecting and uploading maps from your computer. My problems arose when trying both to upload and download the maps. The iPhone app wouldn’t allow me to upload a saved Mindjet mindmap, even though it appeared to be in the proper format. Instead, I got a message stating that it wasn’t of a type that could be uploaded. Downloaded files always added a .xml extension to the file, which made it impossible to double-click and open in Mindjet. Both these issues were easily resolved by removing the .xml from the downloaded file and exporting the original Mindjet document as an OPML file, but it should be much easier to share native documents between the desktop and the iPhone.